Also available from IBX is the 32.15 troy ounce gold “kilo” bar, a one kilogram bar of fine gold bullion of at least .999 purity. Manufacturers of these bars certify the weight and purity of the bullion content by imprinting their stamp or hallmark on each bar. 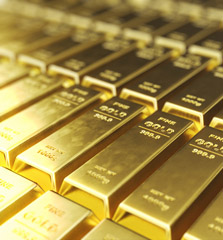 Golden bars of this size and larger offer a distinct investment benefit – that being that they carry a low premium compared to the spot price of gold. This means, that whereas gold coins and smaller bars often contain anywhere from a 3-10% premium for minting and other associated overhead costs, the kilo bar is an industrial product with much lower premiums. Industrial gold is primarily used as a means of storing and transporting universally accepted value and is a very liquid form of wealth. Since 1913, when the United States Federal Reserve was created by Congress, the dollar has lost 96% of its purchasing power due to inflation.